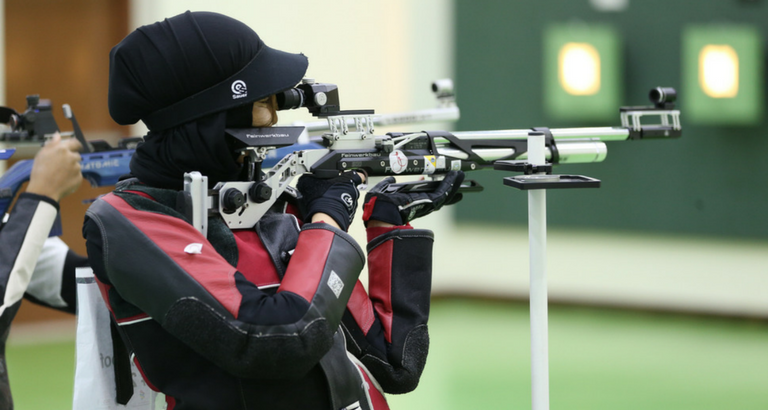 Bahrain dominated the shooting competition at the Arab Women Sports Tournament 2018 (AWST), winning gold in the team final of the 10m Rifle and taking a silver in the individual event, just behind Kuwaiti Mariam Al Razouqi but ahead of third place Omani Siham Al Hasaniya who took bronze. 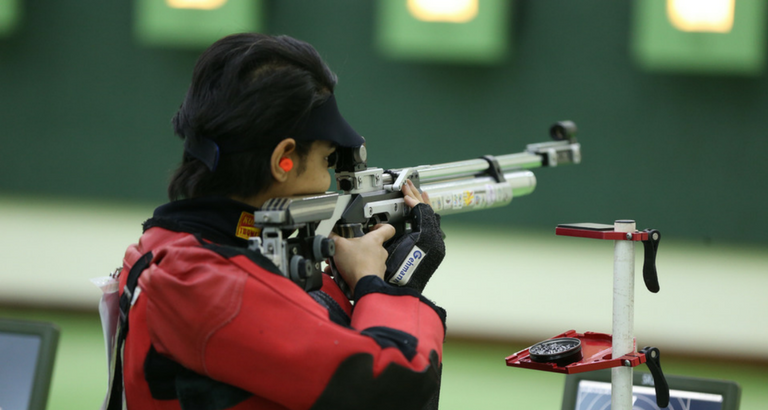 The fourth – and largest – edition of AWST, which runs until 12 February 2018 under the patronage of the wife of His Highness the Ruler of Sharjah, Her Highness Sheikha Jawaher bint Muhammad Al Qasimi, Chairperson of the Sharjah Women Sports Foundation (SWSF) has seen some outstanding markswomen worthy of a place on the world sporting stage. 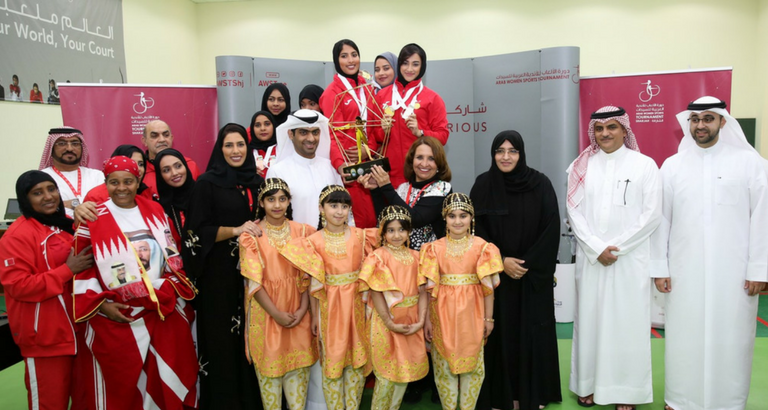 Following the victory of the top Al Bahraini team, Safaa Muhammad Al Dousari, Nouf Khalil Al Dousari and Sarah Rashid Al Dousari, the second place Kuwaiti team, comprising Mariam Muhammad Al Razouqi, Fatima Abdulmalik and Muneera Muhammad Al Anjari took some comfort in the silver, and from Oman, Siham Nasser Al Hasaniya, Amena Khamees Al Tarshiya and Khadija Salmeen Al Jahafiya will be going home with bronze medals. The UAE team, which consisted of Marwa Jawhar Mahjoub, Latifa Yacoub Al Mazimi and Alia Ibrahim Al Nebari, finished just off the podium in fourth place. 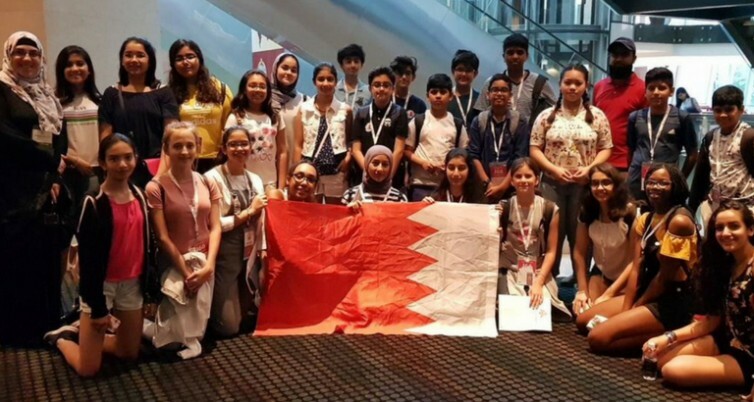 Among those who gave the medals to the winners were Sheikh Khalid bin Ahmed bin Sultan Al Qasimi, Chairperson of AWST Supreme Organising Committee; Engineer Sheikh Salem bin Sultan bin Saqr Al Qasimi, Chairman of the UAE Fencing Federation; Sheikha Sheikha Hayat bint Abdulaziz Al Khalifa, Bahrain Olympic Committee (BOC), Board Member and Chairperson of AWST Supervision and Follow-up Committee; Khawla Al Mulla, Chairperson of the Sharjah Consultative Council (SCC); Nada Asker Al Naqbi, Deputy Chairperson of AWST Supreme Organising Committee, Head of AWST Executive Committee and Director General of SWSF; Abdul Mohsen Fahd Al Dosari, Assistant Secretary-General for Sports Affairs; Nada Asker Al Naqbi, Deputy Chairperson of AWST Supreme Organising Committee, Head of AWST Executive Committee and Director General of SWSF; and Khawla Al Serkal, Director General of Sharjah Ladies Club (SLC). 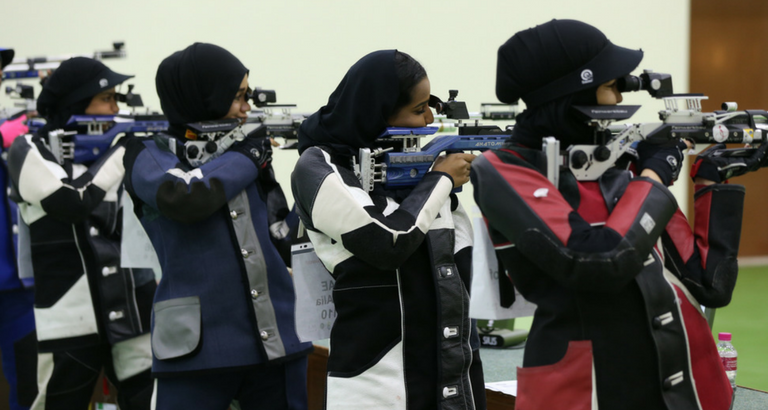 Kuwaiti Shooter Mariam Al Razouqi commended the efforts of Her Highness Sheikha Jawaher to support women in sports in the UAE and the Arab world. She pointed out that the success of this tournament could not have been achieved without her unparalleled support to women’s sports not only in the UAE, but across the Arab world.